Until now, I expected from Lo End Records only CDs from Matt Boroff who plays nice rock music that could do with a little more punch. 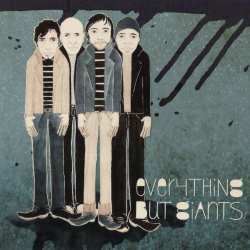 Everything But Giants are a new band on the Austrian label featuring drummer Little Konzett who also plays in Matt Boroff’s band. The band is from Germany which you wouldn’t suspect upon listening. Vocalist Bennie Benson has a warm and agreeable voice that is not so much unlike Matt Boroff’s. The opener Fool Or Now is excellent melodic indie rock that nearly sounds like a balled of the Beatles, sticking instantly in your ears. Towards the end, the song opts for a harder sound. The following Zamonia also gives ample room to the guitars. The more rhythmic and swinging Home Is Where Your Head Is shows the band from a truly grooving side. The EP ends with It’s All About Bliss, a sad but beautiful ballad. Everything But Giants have left with their debut a very appealing visiting card. We will have to wait until late 2010 for their forthcoming longplayer though. The EP is strong enough to find its way back to my stereo.